This is the first in a series of articles about the family which I will publish over the next few months. As there can be long intervals between my blogs, I need to restate earlier information if you, members of the extended family, are to make sense of all this. In my last blog I described what happened to Sylvester Donoghue (b.1821), who was the grandson of another Sylvester the older brother of my ggggrandfather, James Donoghue and the Sylvester of the tomb in Rattoo. James and his wife, Julia Boyle, had at least six children: Patrick, Ellen, James, Thomas, Mary, John. 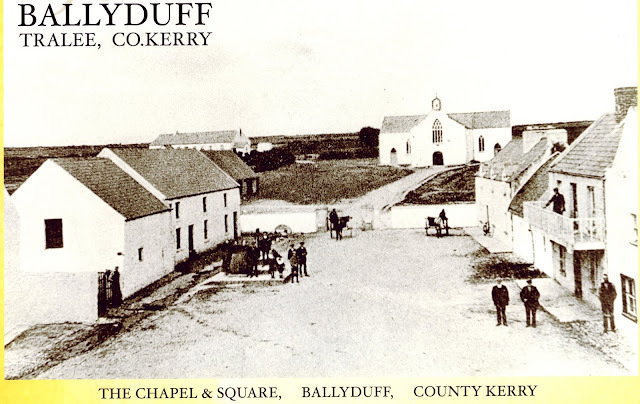 They lived in Ballyduff, north Kerry. It is their story and that of some of their children that I will tell in this series of articles. As guidance, when I show (b. with a year) it will be either birth or baptism and should in most cases be regarded as approximate. Ireland went through some bad times during their lives so first I will set the scene. In 1754, shortly before Sylvester was born the population of Ireland is estimated to have been around two million. By 1821 it was 6.8 million and by 1841, 8.1 million. What caused such rapid growth is still a matter of controversy, but at least some of the reasons are clear: traditionally, the marriage age was relatively low (even 12), which led to very large families; and the subdivision of holdings, enforced by the Penal Laws, permitted increasing numbers to marry and stay on the land, albeit at the cost of increasingly poorer standards of living. In the aftermath of the Napoleonic wars, from 1814, came an immediate and dramatic economic slump: prices fell dramatically, major industries collapsed, investment and growth stagnated, and unemployment and destitution became widespread. The depression lasted for almost two decades, and was accompanied by a series of natural catastrophes. In 1816-1818, bad weather destroyed grain and potato crops, and smallpox and typhus killed over 50,000 people. The potato failed again in Munster in 1821, and people starved to death in Cork and Clare. After further crop failures in 1825-30, famine was averted only by the import of large amounts of Indian meal from America, and in 1832 ‘stark famine’ struck Munster and south Leinster. Throughout the early 1830s, cholera repeatedly ravaged the poorest classes, and, in the decade as a whole, the potato crop failed on a local level in eight out of the ten years. 1838 saw a savage winter, and ‘on the night of the big wind’ (about which more in a future blog), snow buried the cottages and cattle froze to death in the fields. Finally, in 1840-1844, the potato crops partly failed three more times. Small wonder that the Irish should feel God had abandoned them. "There is a Distruction Approaching to Ireland", wrote one emigrant, "their time is nerely at an end". The period known as ‘The Great Famine’ of 1845-8 is the focus of this blog; it and the laissé faire behaviour of the government in London will remain in Irish folk memory for centuries. By 1851 the country’s population had reduced to 6.6m (from 1841 8.1m) and by 1881 it was down to 5.1m. So it is clear that our ancestors could have vanished from the records for many reasons of which death and emigration are the most obvious. Death records in the first half of the nineteenth century are sparse. So we must mainly turn to emigration to see what can be discovered. Around 1848 a ticket to England cost five shillings (25p) or half a crown (12.5p) and to America around £5. Ballyduff lies in the RC parish of Causeway. Causeway’s townlands lie in both Rattoo civil parish (an administrative division) and Killury parish. All of these parishes were part of the barony (another administrative division) of Clanmaurice. During the famine another division was set up, the Poor Law Union (PLU), to organise public works (mainly roads), administer and distribute relief for the poor and run the workhouses. For Ballyduff, Listowel was the relevant PLU. In Kerry 28k people out of a population of 294k were employed on relief works. Between 1841 and 1851 the population of Kerry dropped 19% from death and emigration but for Clanmaurice barony the decline was 36%. Killury and Rattoo civil parishes declined 46% and 44% respectively so worse than the barony as a whole. Listowel PLU (with a population of 79k in 1841) was closer to the county average at 19%. Ballyduff itself, within Listowel, went from a population of 331 in 1841 to 269 (also 19%) in 1851, but in the next three decades the decline was very steep from 214 in 1861 to 101 in 1881. The behaviour of the landlords, many of whom were absentees, varied considerably from those who left their communities to their fate to those who did all they could to support them, in some cases bankrupting themselves. The three main Protestant landlords in Ballyduff and the adjacent townlands were Stoughton, Gun and Rice and I have been told that they were good men with good working relationships with their communities. The Stoughtons moved back to England but appeared periodically; the Guns moved but remained in the area. Their workforce was decimated and, if they had stayed, they might have been ruined. That meant for those local people who survived there was no work; disillusioned, they thought that the bad times would never end. For Thomas, my gggrandfather and a farrier, land usage was moving to tillage with less horses used. Landlords who survived were consolidating as many sold up, and local people had difficulty getting a bit of land. As the Ballyduff population in 1881 shows, people just left. There are no Donoghue entries in the parish register from 1847 until 1895. Julia, my ggggrandmother, however, stayed in the village until her death. This was the view from her house’s position in 1901. Patrick was born around 1800. The fact that he, as the first son, was named Patrick suggests that his grandfather and my gggggrandfather may also have been of that name. Catherine was from the townland of Knoppoge immediately north of Ballyduff.. They had at least three children: Patrick (b.c.1821), Mary (b.1823) and John (b.1826). Patrick was living in a house and garden next his mother, Julia, in the middle of Ballyduff prior to 1848. By that year his sister Mary’s husband Thomas Ryle had taken it over. So did he die or emigrate and what happened to his wife and children? Their son, John, married Joanna Costello in 1847, for which Ellen Connor was the witness. I do not yet know what happened to their daughter, Mary. I have found a Patrick and Catherine of the right ages in Prescot, Lancashire on the east side of Liverpool in 1851 but cannot be sure they are ours. No relevant cases were found in the US, Canada or Australia. As I will describe in a later blog, I do suspect that our family left Ireland from Dublin for Liverpool. My focus in this blog will be on their first son, Patrick. Patrick, their eldest son, was born in c.1821 and married Anastasia in c.1840. It is amazing, at least to me, how many Boyles figure in the marriages of our Irish ancestors of this generation. Anastasia seems an unusual name for 18th/19th century Ireland, but it is not actually, as I have found quite a few in Kerry from 1750 to 1850. There was a saint of the name who was mentioned in the Litany that folk heard in the Mass every Sunday so that must explain it. As an aside, my gggrandparents, Thomas and Ellen, gave this as a second name to their last born. Our Anastasia also went by the name Nanet, and by the time she got to Poplar she was called Ann – they would have had great trouble being understood, so this was a good move! They had two children in Ireland: Mary (b.1844) and James (b.1847). Our Julia (called Jude on this occasion) was once again a sponsor at the baptism of Mary. 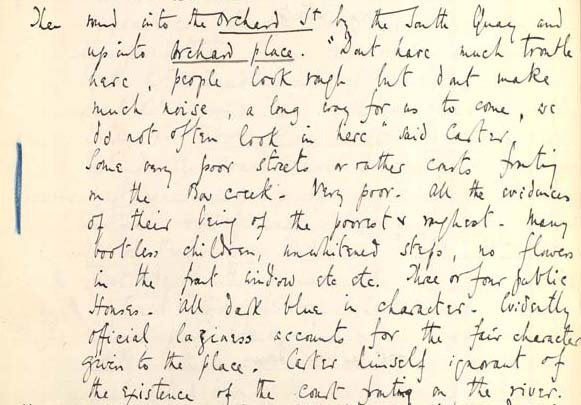 And then they turn up in Poplar…with an 8 month-old child, Juliana, which strongly supports them as our family, but without Mary and James, which suggests that they had died as they were born at the height of the famine. Members of their mother, Catherine’s, Dee family had already moved to London and around 1850 Patrick and Ann had joined them. They are shown as lodgers with Thomas and Hannah Dee in 9 Salters Buildings, Bow Creek. 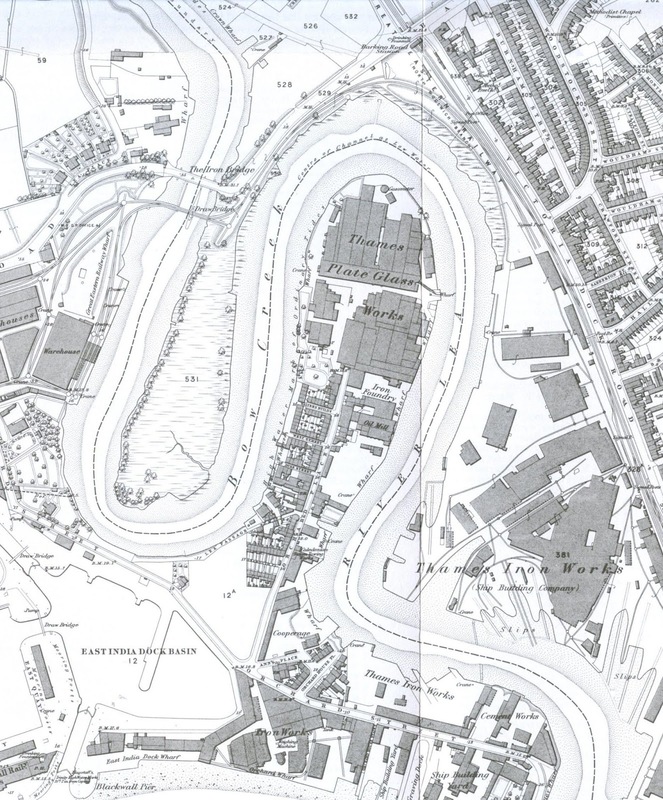 Salters Buildings is the last block on the left before the Thames Plate Glass factory at the end of the main street, Orchard Place also known as Orchard House, on the 1867 Ordnance Survey map below. This area was known as ‘the lost village of Poplar’ because it was an isolated hamlet situated on the banks of the River Lea as it approached its confluence with the River Thames. It was cut off from the rest of Poplar in 1803-6 by the building of the East India Docks, on part of Poplar Marsh. The only access was by a long walk from the East India Dock Road down Leamouth Road which was lined by the tall brick walls of the warehouses which were on either side of Orchard Street (later renamed Leamouth Road). The Thames Iron Works, on both sides of the river, was a later employer of our family; perhaps this is where Patrick worked. But thirty-eight years earlier, in 1851, the area would have been much less densely populated and other commentators have said the Booth was too harsh. In Ballyduff they lived close to a river and I wonder if this is what attracted them to Bow Creek. An Edward Donohue (b.1814) and his family were living in 2 Salters Buildings. He was a boilermaker, our family’s trade, but was born in Manchester. Edward is not a family name but I do wonder if an earlier generation had come to England and whether this might explain the Patrick and Catherine couple in Prescot, Lancashire. 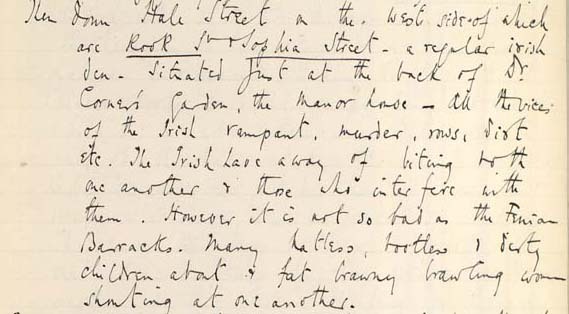 By 1861 Patrick and Ann had moved on to Sophia Street just round the corner from his uncle and aunt Thomas and Ellen, my gggrandparents, in Mary Street, which by the time of Booth’s survey was renamed Rook Street. By 1861 they had three children Julia (b.1851), Daniel (b.1852) and Anna (b.1860). See the map below for the location of these streets. If I needed any further confirmation that they were our family, their lodgers say it all: James Boyle (b.1811) and his son, also James (b.1854) who was born in St Giles, Middlesex which suggests this may be another area where a related family settled. The elder James was probably Ann’s brother. Moving on to 1871, the family had moved a little further east to 4 Oriental Terrace, just south of the East India Dock Road and north of Pennyfields. There is another child, James (b.1864). Lodging with them is Michael Ryle shown as b.1846 but almost certainly the son of Patrick’s sister, Mary, who was baptised in 1842 in Ballyduff. Do not worry about the date disparity. Patrick died in 1875 of bronchitis in the Sick Asylum, Bromley. By 1881 Ann, Daniel, Anne and James are living at 24 Grove Street. Once again the family stayed together because Ellen is living with her daughter Julia in Market Street within no distance at all. Unsurprisingly, Patrick appears to have worked in the docks as a labourer all his time in Poplar.